It’s been a whirlwind 4 years for hip-hop/rap/pop artist HillaryJane. From releasing her chart-topping and well-received EP Stix and Stones way back in July 2014 (that birthed the prominent and poignant songs ‘Chimneys’, ‘Stix and Stones’ and ‘Wild Side’), to becoming a Youtube vlogger and regularly posting videos about various topics, alongside being a married woman, as well as owning her own home with her husband; there’s been a lot that has happened in Hillary’s life thus far. And while I’m sure Hillary has wanted to release new music for a while (but probably couldn’t because of legal reasons or such), here in 2018, she has released new music, and according to her youtube live chat video, this new song ‘replay’ is to be the first of many new songs- culminating into a project of hers to be released later on during the year. Since becoming a force on social media of late, fans of her previous music have followed her presence on platforms like facebook and twitter, as well as following her presence on Youtube as well, as she speaks on topics like Christians and suicide, blame shifting, overcoming insecurities, micro-cheating, as well as why she’s getting baptised…again. With a wide variety of topics and things to explore on her youtube page, Hillary is certainly busy, and now with the release of ‘replay’, the first of many to occur this year, Hillary doesn’t appear like she’s slowing down anytime soon. With her presence in the hip-hop/pop industry being very much welcomed by myself, when we know that this hip-hop/rap/pop industry is certainly dominated by males (think Lecrae, NF, Flame, Derek Minor, This’l, Tedashii, KB, Andy Mineo, Steven Malcolm, TobyMac, Trip Lee…you get the picture), HillaryJane and her music is certain to create a fair amount of buzz and anticipation, and ‘replay’ is no different. 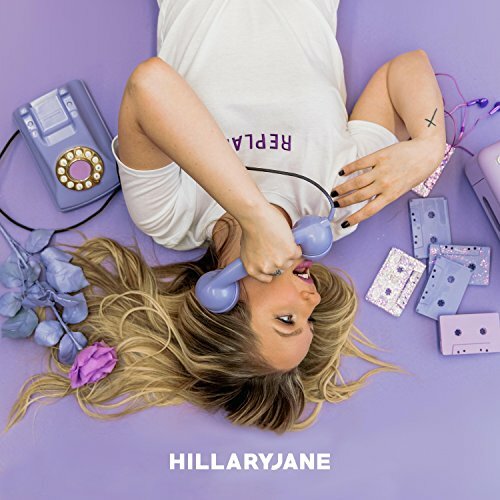 This new song by Hillary (alongside her past EP) is a must have for anyone who loves hip-hop, or even other female artists of a similar genre, like Hollyn or V. Rose (both of whom I am reminded about when hearing Hillary and her music!). Giving us a fresh, unique and poignant look at how hip-hop music is presented from a female POV, ‘replay’ is perhaps one of the most out-of-the-box, unique, and left-field songs I’ve heard all of this year thus far! As the song discusses Hillary’s own personal continual need for God and His presence, and how ‘…You know me better than I know myself, sympathizing everything I felt, realizing that I need Your help, You got me, You got me…can’t erase what You’ve always done, can’t undo what You’ve overcome, can’t believe that You called me, “Loved”, You got me, You got me…’, this song, though only standing at 3:08, is nevertheless one of the most life-affirming songs I’ve come across this year. ‘replay’ the word, in relation to the context in which it was presented in the song, is a reminder that we as Christians need to constantly be reminded of God’s goodness in every circumstance, and thus, we place God’s word on ‘replay’, knowing full well that in order to believe into the promises of God is to continue to put His words on ‘replay’- to hear them again and again and allow God’s Spirit to speak to our Spirit. HillaryJane is back in the world of music after an hiatus (though I’m sure not of her choosing), and this new song ‘replay’ is just the beginning. And if her new music is anything like ‘replay’, then I’m in for a real treat in the upcoming months ahead! Here’s what it’s like to be in an artist’s head: You want to be unique but “main-stream” enough that people don’t think your music is too weird, so you try to have all of your creative ideas come alive but also give the people what they want so they’ll be a “fan” & follow your music. Sometimes you have ideas that you can’t articulate and actually get out of your head, so they stay inside forever. Sometimes you have all the ideas in the world and no money to make it happen. Sometimes you want to bear your soul because music is therapy, but you know 90% of people are ready to throw stones as if Christians can’t have legitimate struggles and still love Jesus. Sometimes people want a sermon when you want to give an entertaining show. Sometimes people only want you to entertain them when you want to talk about Jesus for 15 minutes. Sometimes people want you to “stick to music” and never have an opinion on any topic as if you’re just one of those guitar playing animatronics at Chuck E. Cheese to entertain at will. Sometimes you believe that’s all you’re here to do. Sometimes you want to wake up and try something new you’ve never done but are afraid people will only “like the old you.” Sometimes you just want to post pictures of your dog or book and no one cares because it’s not your face. Sometimes you forget being an artist is not your identity and doesn’t define you. This above post (or part of a post) is from HillaryJane’s facebook not too long ago, and is a reminder to each of us of the happenings and goings-on of an artist behind the scenes. Hillary and her music I’m sure are not immune to these things depicted in the above paragraph. ‘replay’ and the length of time it took to release (4 years) stands a testament to these above words. And now that ‘replay’ is here, I can say that Hillary is certainly an underrated artist, maybe even one of the most underrated as of this moment. And yet it was her EP Stix and Stones that was a breakout set of songs for her, and ‘replay’ is yet another song to add to her own repertoire. Though I’m sure we may never know why it took so long for Hillary to create new music, I’m sure we will never know, and that’s ok. Hillary is back, and is not going anywhere for a while yet. ‘replay’ is by far a challenging and fun-filled song, can’t wait for the new single (that makes up an EP to release later on during the year), whenever it arises!